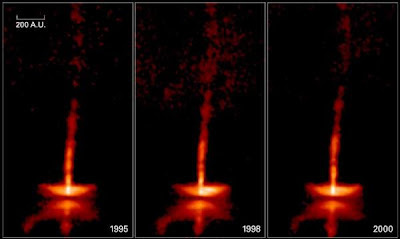 The discovery of bipolar outflows from young stars or Herbig-Haro objects in the late 1970s and early 1980s were revealed to be jets of ionized gas that emanate from young “exciting” stars surrounded by circumstellar accretion disks. 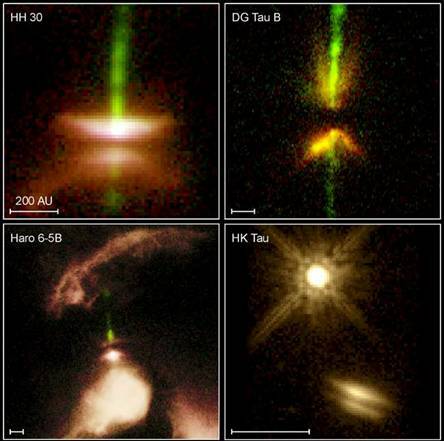 These Herbig-Haro objects exhibit spectroscopic emission lines that are characteristic of highly ionized gas that has been shocked upon interaction with the surrounding interstellar medium as it is moving at supersonic velocities of 100 km/s (60 mi/s) to more than 1000 km/s (600 mi/s). More recently it was discovered that there appear to be two vast structures, stretching to the north and to the south of the centre of the Milky Way, that are so big that a beam of light, travelling at 186,282 miles per second, would take 50,000 years to get from the edge of one to the edge of the other. The previously unseen bubbles were discovered by astronomer Doug Finkbeiner, of the Harvard-Smithsonian Center for Astrophysics in Cambridge, Massachusetts, using NASA's Fermi Gamma-Ray Telescope. He admitted: "We don't fully understand their nature or origin." They are thought to be millions of years old and were not noticed before because they were lost in a fog of gamma radiation across the sky. Astronomers' best "guess" is that the bubbles were created by an eruption from a supersized black hole at the centre of our galaxy. 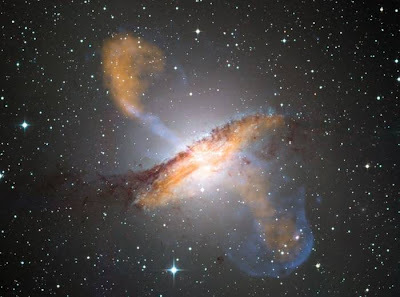 Scientist David Spergel, of Princeton University, New Jersey, said: "In other galaxies, we see that starbursts can drive enormous gas outflows. 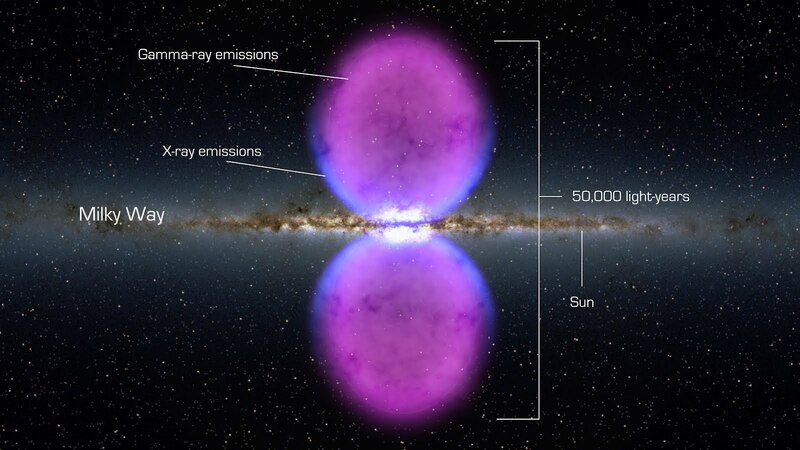 Whatever the energy source behind these huge bubbles may be, it is connected to many deep questions in astrophysics." 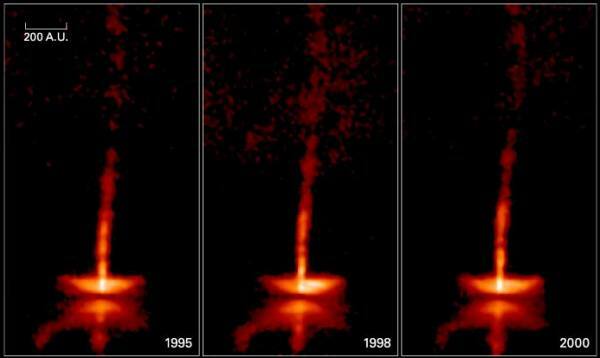 The interesting part is that there seems to be a pattern between spinning systems and the outflow of matter along the axis of rotation. 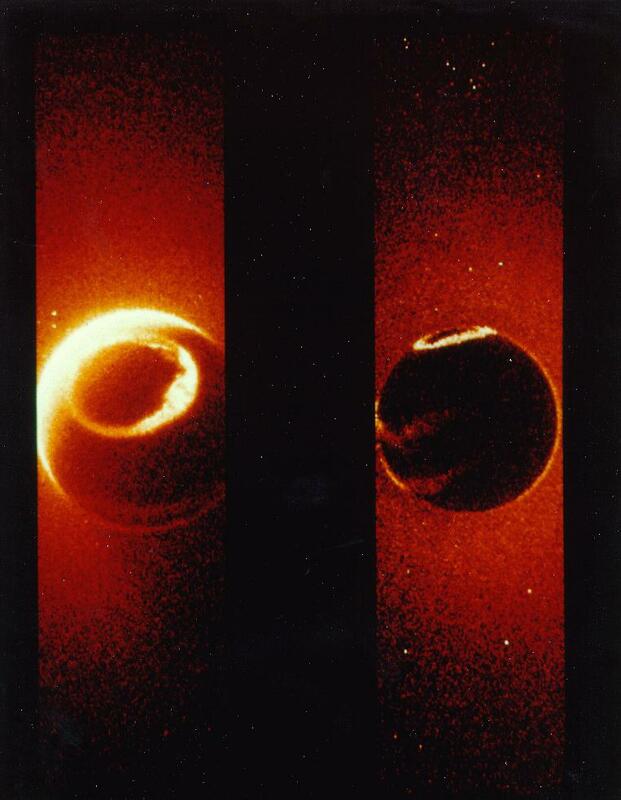 The cleft ion fountains are also ionized jets of particles that flow outward from the earth's poles to fill the earth's magnetosphere with ions and generate the auroral displays we often attribute to the solar wind. There appears to be a symmetry involved here which baffles most scientists. Perhaps there is something going on which the conventional models of physics cannot explain, in which case, is it possible that the more 'unconventional' models have something to offer? This was a fascinating read and one of most interesting posts here so far! More please! This is indeed very interesting. Have you ever looked at thunderbolts.info? I dont think this photo is for real. looking at it from a light year distance and seeing 50,000 lightyear size of the two bubbles would mean that the camera or the equipment for that matter which took the picture is farther that 200,000 lightyear distance..I think hubble telescope is just somewhere near our earth. its a nice picture and a nice story..you could fool many.